Selling Your Property "For Sale By Owner"
Why work with Troy and Mia? The February Phoenix and East Valley housing market report continues to show a slowing in the overall housing market, which is a little surprising considering how interest rates have been dropping. Sales prices continue to be the one good sign in the Phoenix and East Valley housing market. The median sales price continues to increase, and was $264,900 for February. This is a 1.0% increase from the median January sold price of $262,368, but is a 5.1% increase from the median sales price of $249,945 from February of 2018. This is the third month in a row sold prices have increased, and the highest median sold price since July of 2018. 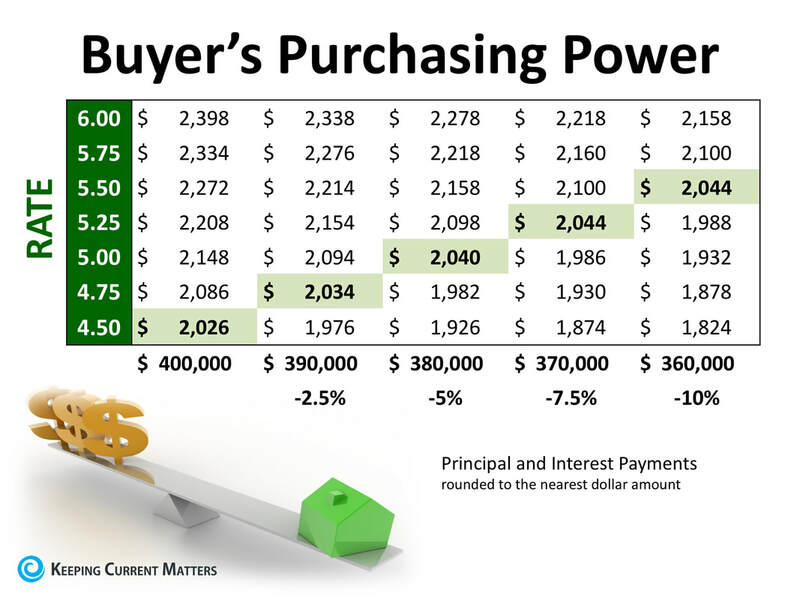 Sold prices typically increase from January to June, so this is not surprising. However, the price increase from January to February this year is less than the price increase from January to February of last year, and this may be a sign that although prices may continue to increase through 2019, it may be at a slower pace than in the previous four years. >>Click Here: Free Report on How much is my home worth? tell us a lot about how the 2019 housing market will be. 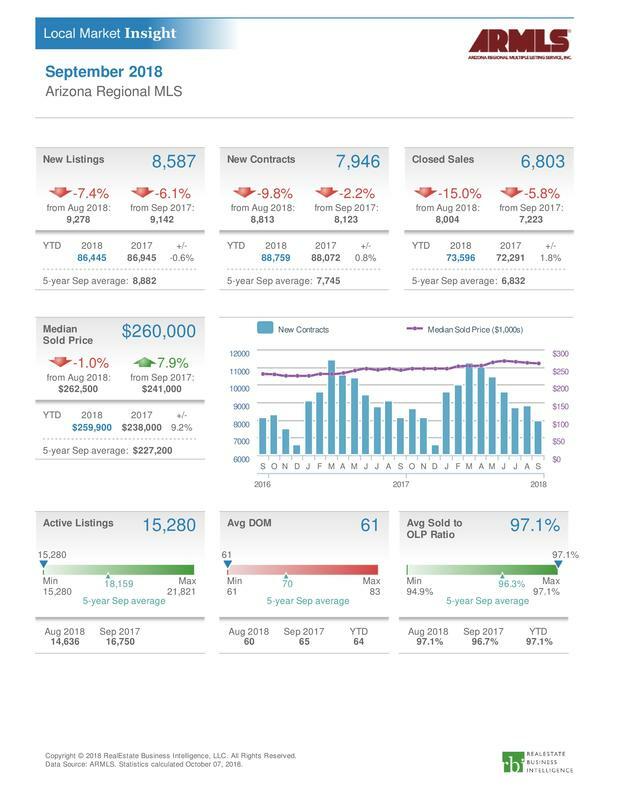 So far it looks like a slow start to the 2019 Phoenix Metro and East Valley housing market, continuing the slowing trend that took place over the last half of 2018.
is slowing. Overall, this is still a low number for DOM, which means homes in Metro Phoenix and the East Valley are selling slightly faster than they would be in a normal market. sale, and even though we saw a slight drop this month (we saw a drop in February of 2018 as well), the number of active listings seems to be on the rise. As long as inventory remains low, home values and demand will remain high. After almost doubling from December to January, the number of new listings decreased 1,264 (or 12.3%), to 9,013 in February. This is also 3.7% less than February of last year. After seeing January jump so high, it is unfortunate to see February drop so low. However, the number of new listings also dropped last year between January and February, just not as much. March of 2018 saw the highest number of new listings in one month (10,937), so it will be interesting to see if we will see that same thing this March. ​The number of new contracts increased for the second straight month, up to 9,364. Although this was an increase of 572 (or 6.5%) from January, it was a decrease of 596 (or 6.0%) from February of 2018. March of 2018 also saw an increase in the number of new contracts before we saw the next eight out of nine months have a decrease in the number of new contracts. Next month should tell us a lot about how sales will be for 2019 in Phoenix and the East Valley, but so far it looks like we are going to have a slightly slower market than we did in 2018. The average sold price to original list price increased to 96.6%, after decreasing or remaining the same for the last six months. The ratio sitting at 96.6% is slightly less than in February of 2018, when it was at 96.8%. An increase in the sold to list price ratio is what we would expect this time of year, and it should continue to increase throughout the Spring and into the Summer. With the inventory of homes for sale remaining lower than average, there is still a large demand for homes, and the Phoenix Metro and East Valley housing market is still a sellers market, even though it seems to be heading towards a more normal market. Free Report - What are homes selling for in my neighborhood? ​With the number of Phoenix Metro and East Valley listings decreasing, and the number of homes being sold each month averaging less than last year, this may be a sign that the sellers market we have seen over the last four years is slowly starting to shift. 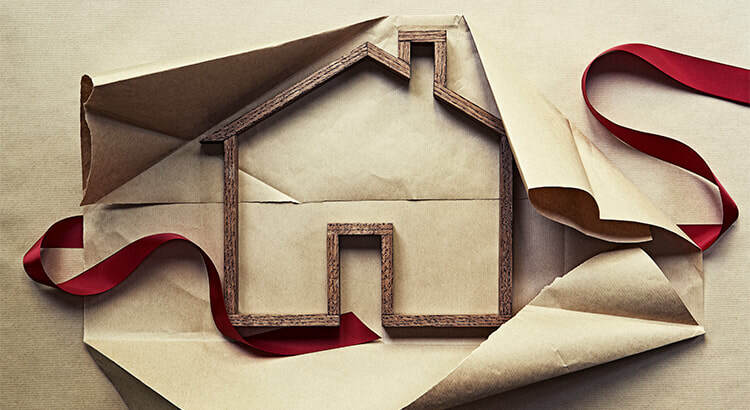 However, home values are still projected to continue to increase, just at a slower pace in 2019 than in previous years, while interest rates have surprisingly decreased so far this year. and East Valley area are still selling in just over a month from when they first hit the market. You need an agent that can provide you an accurate list of homes for sale as soon as they are listed, as well as an agent that can help negotiate a great deal, and ensure that your transaction closes. I have additional market reports and statistics included on my website, and you can find this information by clicking the following link, Arizona Multiple Listing Service Market Stats and Reports. The average sold price in February for Metro Phoenix and East Valley homes is $328,580. The average sales price has increased by 6.36% from February of 2018 ($308,930). The median sold price in February for Metro Phoenix and East Valley homes is $264,900. The median sales price has increased by 5.1% from February of the previous year ($252,000). The number of new purchase contracts in February increased to 9,364. New purchase contracts have decreased 6.0% from February of 2018 (9,960). The number of active listings in February have decreased to 17,571. Active listings have increased 12.02% from February of 2018 (15,685). The average Days on Market has increased to 72. 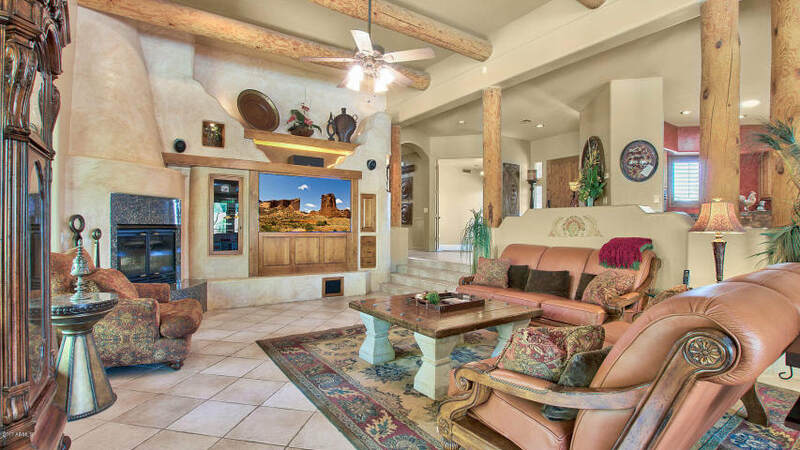 Visit my website to search homes for sale in Phoenix, and the East Valley cities of Chandler,Tempe, Gilbert, Ahwatukee, and Mesa, or to be notified when homes in Phoenix and the East Valley come on the market and are listed for sale. If you have any questions, or would like additional information about home buying, home selling, or investing in real estate in Phoenix, or the East Valley of Arizona, just call/text me at 602-295-6807, or email me and I can help! "Real Estate is not just a job for me, its about making a difference in the lives of others. ​I help people just like you Buy, Sell, and Invest in East Valley Arizona Real Estate!" January usually starts the Phoenix and East Valley housing market off on a positive note heading into the new year. This January does show some positive signs regarding the Phoenix Metro and East Valley housing market, but it also shows that some things might be slowing down. First off, the January median sales price of $262,368 is a 0.5% increase from the December price of $261,000, but is a whopping 7.1% increase from the median sales price of $245,000 from January of 2018. Most of the median sales price growth in 2018 occured during the first five months of the year. Sold prices have remained essentially the same since last August, when the median sold price was $262,500. This means that home values may be leveling off, but they are projected to continue increasing through 2019, just at a slower pace than in the previous four years. Free Report - How much is my home worth? The number of days on market (DOM) for January has reached 70. The DOM has been consistently increasing since a low of 59 in October, but is lower than it was in January of 2018 when it was at 74. This is typically the seasonal flow for days on market, as it tends to slow down through the fall and winter months, then starts to decrease in February as home sales start to pick up during a normal market flow. Overall, this is still a low number for DOM, which means homes in Metro Phoenix and the East Valley are selling slightly faster than they would be in a normal market. February will be a good indication of which direction the market may be heading if the number of DOM continues to increase. The average sold price to original list price is still high at 96.2%, but has been steadily decreasing since last July when it was at 97.5%. The ratio sitting at 96.2% is a slight decrease from December when it was 96.5%, and also barely lower than it was last January, when it was 96.3%. This steady decline is an indication that the list price of homes may be getting too high for buyers, and it might be the beginning of a market shift. However, there is still a large demand for homes, and the Phoenix Metro and East Valley housing market is still a sellers market, although it is heading towards a more normal market. The number of new listings increased to 10,277, up 252 (or 2.5%) from January of last year, and almost double the listings from last month when new listings totaled just 5,771. This is a significant increase, but it is typical to see new listings in January jump to begin a new year. 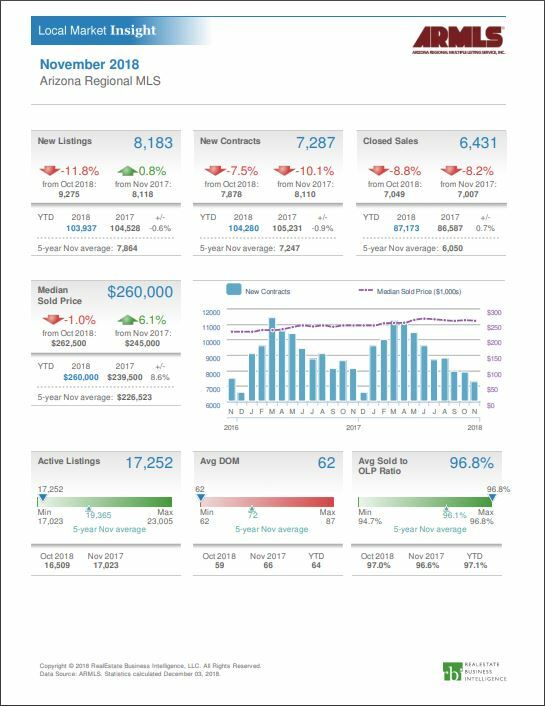 This is the highest number of new listings in one month since we saw 10,937 new listings in March of 2018.
number of active listings over the last six months, and an increase of 1,766 new listings from January of 2018. This is also still 1,429 fewer listings than the 5-year average (19,154) for this time of year. The Phoenix Metro and East Valley market still has a lower than normal inventory of homes for sale, but does seem to be on the rise. As long as inventory remains low, home values and demand will remain high. January marks the seventh out of the last eight months that the Phoenix Metro and East Valley housing market has see a decrease in the number of homes sold. The total homes sold for January was 5,342, which was not only a decrease of 1,015 (-16.0%) from December, but also a decrease of 682 (-11.3%) from January of 2018. The 5,342 homes sold is lower than the 5-year average for January, and the second month in a row that the number of homes sold has been lower than the 5-year average. This marks a slow start to the 2019 Phoenix Metro and East Valley housing market, and continues the slowing trend that took place over the last half of 2018. The number of new contracts increased 47.0%, to 8,792 in January, from a 12 month low of 5,981 in December. This marks the first increase in new contracts since last August, but it is typical for the Phoenix Metro and East Valley housing market to see a significant increase in new contracts from December to January. However, the number of new contract this January was 8.3% lower than the 9,593 new contracts that we saw in January of 2018. This could also be a sign that home sales in 2019 might be slowing. With the number of Phoenix Metro and East Valley listings increasing, and the number of homes being sold each month decreasing, this may be a sign that the sellers market we have seen over the last four years is slowly starting to shift. However, home values are still projected to continue to increase, just at a slower pace in 2019, and interest rates have actually gone down so far this year. Having a good real estate agent who understands the housing market is a must. Homes in the Phoenix Metro and East Valley area are still selling in just over a month from when they first hit the market. You need an agent that can provide you an accurate list of homes for sale as soon as they are listed, as well as an agent that can help negotiate a great deal, and ensure that your transaction closes. The average sold price in January for Metro Phoenix and East Valley homes is $328,298. The average sales price has increased by 4.39% from January of 2018. The median sold price in January for Metro Phoenix and East Valley homes is $262,368. The median sales price has increased by 7.1% from January of the previous year. The number of new purchase contracts in January increased to 8,792. New purchase contracts have decreased 8.3% from January of 2018 (9,593). The number of active listings in January have increased to 17,725. The average Days on Market has increased to 70. Real estate market data for Phoenix, AZ provided by Troy Erickson Realtor of Good Company Real Estate. December is typically one of the worst month for real estate in Arizona, and this December was no different, although the median price of Phoenix Metro homes actually increased by 0.4%, to $261,000. This was also a 6.5% increase from December of last year ($245,000), but still below the high of $267,264 in June of this year. The number of days on market (DOM) remains low, at 66, but has been increasing slightly over the last couple of months, from a low of 59 in October. This is still a low number for DOM, which means homes in Metro Phoenix are still selling at a rapid pace. The average sold price to original list price remains high at 96.5%, even though this is the fifth straight month we have seen a decrease since the high of 97.4% in July. This is mainly a seasonal adjustment, and overall a good sign that there is still a demand for homes, and homes are holding their prices. All of these factors show that even though we are into the winter months, Phoenix Metro housing is still in a sellers market. The number of new listings decreased a whopping 29.5% from 8,183 last month, to 5,771 in December. This is a very significant drop, but very typical for the last month of the year. New listings in December of 2017 were 5,950, making this December just 3.0% lower than last December. The total number of active listings dropped to 16,623 this month, after increasing for four straight months. This ends up being 1,828 fewer listings than the 5-year average (18,451) for this time of year. The Phoenix Valley continues to see a low inventory of homes for sale, which helps values to remain high, as well as demand. December marks the sixth out of the last seven months that the Phoenix Metro housing market has seen a decrease in home sales. November saw an 8.8% decrease in closed sales, down to 6,431 , and December followed that with a decrease of 1.2%, down to 6,357 homes. This is also 637 fewer closed sales than in December of last year, a decrease of 9.1%. The Phoenix Metro housing market did not finish this year (93,542) selling more homes than last year (93,632) as predicted, but fell short by only 90 homes. 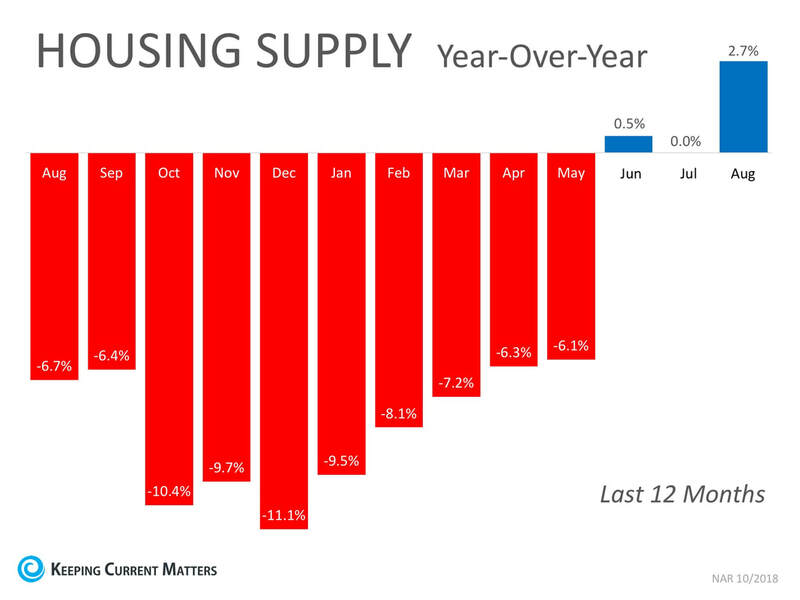 This is a good sign overall for the Phoenix housing market heading into 2019, especially since the inventory of homes has been so low throughout the year. ​Phoenix Metro area are still selling within a few weeks of hitting the market. You need an agent that can provide you a list of homes for sale as soon as they hit the market, as well as an agent that can help negotiate a great deal, and ensure that your transaction closes. The average sold price in December for single family homes in Metro Phoenix is $326,646. The average sales price has increased by 6.17% from December of the previous year. The median sold price in December for single family homes in Metro Phoenix is $261,000. The sales price has increased by 6.53% from the previous year. The number of new purchase contracts in December decreased to 5,981. New purchase contracts have decreased 9.2% from December of 2017. The number of active listings is at 15,280. The average Days on Market is 61. Visit my website to search for homes in Phoenix or to be notified when homes in Phoenix and the surrounding area come on the market. ​You can also click on the following link to find out what your home is worth. If you have any questions about home buying, home selling, or investing in real estate in Chandler, or the East Valley of Arizona, just call/text me at 602-295-6807, or email me below, and I can help! 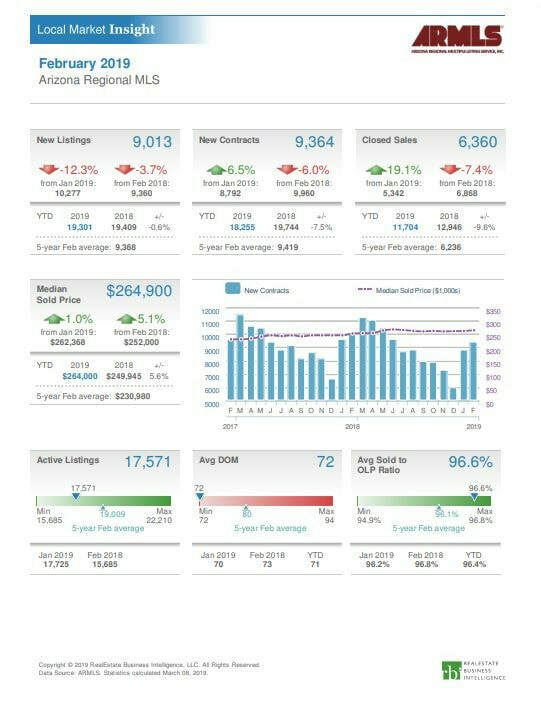 Real estate market data for Phoenix, AZ provided by Troy Erickson Realtor of Diverse Solutions Realty. Prices of Phoenix Metro homes decreased slightly (1.0%) in November to $260,000, back to what they were in September. However, this is still a 6.1% increase from November of last year ($245,000), but still below the high of $267,264 in June of this year. The number of days on market (DOM) remains low, at 62, but did increase from 59 last month. Having such a low DOM means homes in Metro Phoenix are still selling at a rapid pace. The average sold price to original list price remains high at 96.8%, even though this is the fourth straight month we have seen a decrease since the high of 97.4% in July. This is mainly a seasonal adjustment, and overall a good sign that there is still a demand for homes, and homes are holding their prices. All of these factors show that even though we are heading into the winter, the Phoenix Valley is still in a sellers market. significant drop, but it was unusual to see the increase in new listings from September to October, so this number is more in line with what is expected this time of season. The number of new listings is actually a little higher than in November of last year, which was at 8,118, after being lower than the previous year the last two months. The total number of active listings increased for the fourth straight month, and the November 2018 was 17,252. This is still 2,113 fewer listings than the 5-year average for this time of year. The Phoenix Valley continues to see a low inventory of homes for sale. sales than in November of last year. We are still on track to sell more homes this year than last, which overall is a good sign, especially since inventory has been so low throughout the year. The low inventory of homes for sale in Phoenix still has some sellers receiving multiple offers on their homes. However, with less competition from buyers this time of year, you may have a better chance of getting the home you desire. Having a good real estate agent who understands the market is a must. Homes in the Phoenix Metro area are still selling within a few weeks of hitting the market so you will want an agent that can provide you a list of homes for sale as soon as they are available for sale. The average sold price in November for single family homes in Metro Phoenix is $325,798. The average sales price has increased by 5.81% from November of the previous year. The median sold price in November for single family homes in Metro Phoenix is $260,000. The sales price has increased by 6.10% from November of the previous year. The number of new purchase contracts in November decreased to 7,287. New purchase contracts have decreased by 10.1% from November of the previous year. The number of active listings for November is at 17,252. The average Days on Market is 62. If you have any questions about home buying, home selling, or investing in real estate in Chandler, or the East Valley of Arizona, just call/text me at 602-295-6807, or email me and I can help! "Real Estate is more than just a job for me. It is about making a difference in the lives of others. Troy Erickson Realtor Receives Certificate of Excellence in Real Estate For the third straight year! I am so honored to have received this 'Certificate of Excellence in Real Estate' award from Broker Agent Advisor for the third straight year. It is great being recognized for my local real estate industry knowledge, dedication to my profession, and service to my clients and community. I am so excited to be selected in the Top 10% of Real Estate professionals nationwide, and want to thank everyone who has made this possible. Phoenix, Arizona 12/11/18 - Now in its 23rd year, Broker★Agent™ Advisor celebrates the success and accomplishment of the industry’s finest real estate professionals through it’s exclusive ‘Certificate of Excellence’ Program. Through proprietary criteria, formulas, and other valuable considerations, Troy Erickson of Diverse Solutions Realty has been distinguished by Broker★Agent™ Advisor as one of the best in business based on achievement, potential, leadership, ethics, community value, experience, capability, and trust for their service during the calendar year of 2018. There is no cost or fee required for this award, and all applicant’s credentials are verified, which makes this honor one of the most genuine in the industry towards identifying those truly worthy of special recognition and distinction. Established in 1996 Broker★Agent™ is a real estate trade publication which provides information, tools, and resources to assist the modern real estate professional in achieving greater success through their real practice. Prices of Phoenix Metro homes increased slightly in October, to $262,500, from $260,000 last month (a 1.0% increase). However, this is a 7.1% increase from October of last year ($245,000), but still below the high of $267,264 in June this year. The number of days on market remains low, at 59, tying for the lowest DOM all year (July), which means homes in Metro Phoenix are still selling at a rapid pace. The average sold price to original list price remains high at 97.0%, even though this is the third straight month we have seen a decrease. This is another sign that shows there is still a demand for homes, and homes are holding their prices. All of these factors show that even though we are heading into the winter, the Phoenix Valley is still in a sellers market. After four straight months of decreasing home sales, October saw a 3.6% increase, up to 7,049, but this is still 101 fewer sales than October of 2017. We are still on track to sell more homes this year than last, which overall is a good sign, especially since inventory has been so low throughout the year. The low inventory of homes for sale in Phoenix still has many sellers receiving multiple offers on their homes. However, with fewer competition from buyers this time of year, you may have a better chance of getting the home you desire. Having a good real estate agent who understands the market is a must. 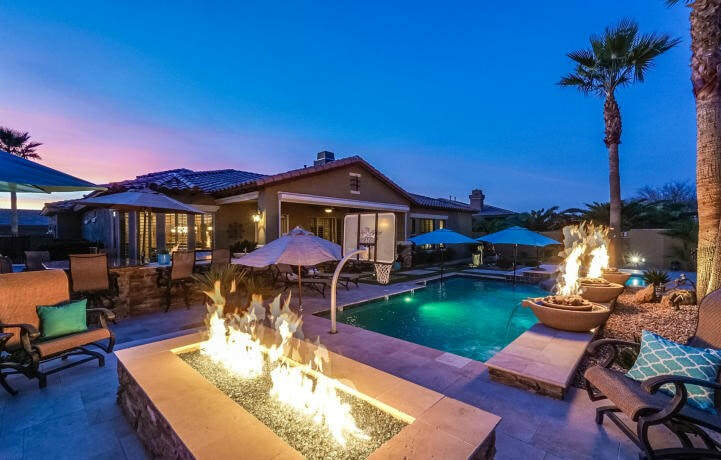 Homes in the Phoenix Metro area are still selling within a few weeks of hitting the market so you will want an agent that can provide you a list of homes for sale as soon as they are available for sale. The average sales price in October for single family homes in Metro Phoenix is $326,110. The average sales price increased by 9.95% from the previous year. The median sales price in October for single family homes in Metro Phoenix is $262,500. The median sales price increased by 7.14% from the previous year. The number of active listings is at 16,509. The average Days on Market is 59. 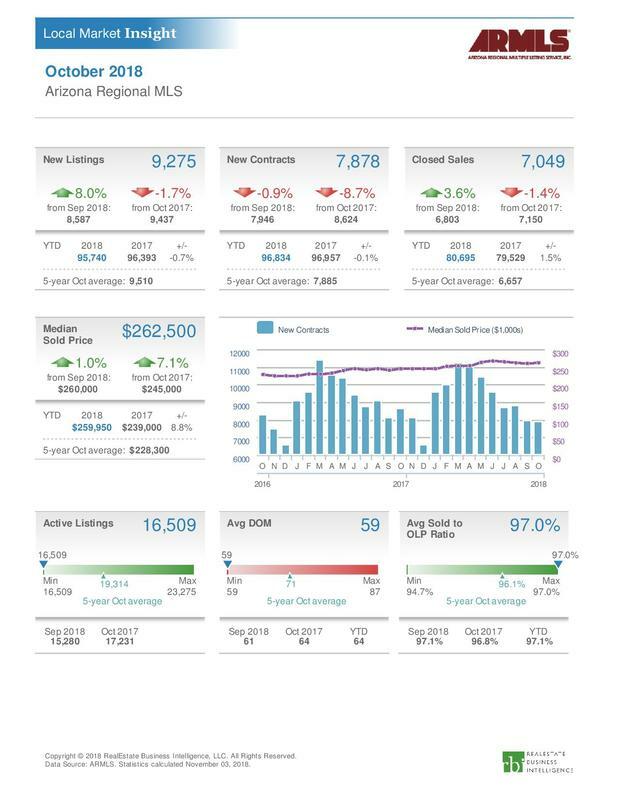 As you can see on the Local Market Insight Report for the Arizona Regional Multiple Listing Service (see report below), prices of Phoenix Metro homes remained fairly steady in September, as the median sales price dropped slightly to $260,000, from $262,500 last month. However, this is a 7.9% increase from September of last year. The number of days on market remains low, at 61, which means homes in Metro Phoenix are still selling at a rapid pace. The average sold price to original list price remains high at 97.1%, which also shows that there is still a demand for homes, and homes are holding their prices. All of these factors show that even though we are heading into the fall, the Phoenix Valley is still in a sellers market. The number of new listings dropped off significantly in September, not only from last month, but also from last year as a whole, as the Phoenix Valley continue to see a low inventory of homes for sale. The total number of active listings for September 2018 was 15,280, which is 2,879 fewer than the 5-year average for this time of year. There was also a significant drop in the number of homes sold, with a 15% drop-off from August, and 420 fewer sales than in September of 2017. However, we are still on track to sell more homes this year than last, which overall is a good sign, especially since inventory has been so low throughout the year. The average sales price in September for single family homes in Metro Phoenix is $316,866. The average sales price increased by 7.69% from the previous year. The median sales price in September for single family homes in Metro Phoenix is $260,000. The sales price dropped by -1.00% from the previous month. The number of active listings is at 15,280. The average Days on Market is 61. Troy Erickson Realtor Named Best of HomeGuide 2018! I am so honored to have received this 'Best of' award from HomeGuide.com for the second straight year. HomeGuide is a home service provider that pairs homeowners and real estate agents together, as well as other professional home contractors. I was hand-picked over thousands of other real estate professionals to receive this award. It is great being recognized for my local real estate industry knowledge, dedication to my profession, and service to my clients and community. I am so excited to be selected in the Top 6% of Real Estate professionals nationwide. Troy Erickson has prided himself on providing outstanding customer services and unmatched real estate knowledge to his clients throughout the East Valley of Arizona, including the areas of Phoenix, Chandler, Ahwatukee, Tempe, Gilbert, and Mesa. He has long been lauded for his service, expert industry knowledge, communication skills, and ability to listen and serve the needs of his clients. We are thrilled to announce that Troy Erickson Realtor has been named to the Best of HomeGuide for 2018! This is a distinctive honor that is bestowed on only a select few real estate industry professionals who exhibit the highest qualities of excellence in both the services they provide and the experience they offer their customers on a repeated and consistent basis. The program takes a look at thousands of other professionals in each geographic area and scores them on more than ten different variables to ensure accuracy, and a complete picture of a business and how they operate. Each company that’s hand-picked to be part of the program scores extremely high in each category. In fact, only six percent of all professionals recognized by HomeGuide are chosen for the program. Troy is extremely proud of this monumental achievement and its reflection of the commitment he makes to each of his clients. Founded in December 2013, HomeGuide has connected more than a million customers to professional home service contractors and companies in markets across the nation. HomeGuide is a unique service which connects professionals to the customers they’re looking for by asking potential customers important questions, such as availability, location, and scheduling. This allows customers to connect with a professional who’s experienced, skilled, and can handle the issue at hand in a way that the customer is looking for. Today, there are more than 30,000 active professionals on the site located all across the United States, and more than 800,000 new customers are added each year, giving contractors and businesses a chance to connect with even more customers they can serve. To schedule a meeting with Troy, whether you are buying, selling, or investing in real estate, you can call or text him at 602-295-6807, or email Troy at TroyEricksonRealtor@gmail.com! Wondering If You Can Buy Your First Chandler or East Valley Home? You may not be much different than many people who have already purchased their first homes. Meet with a local real estate professional today who can help determine if your dream home is within your grasp. 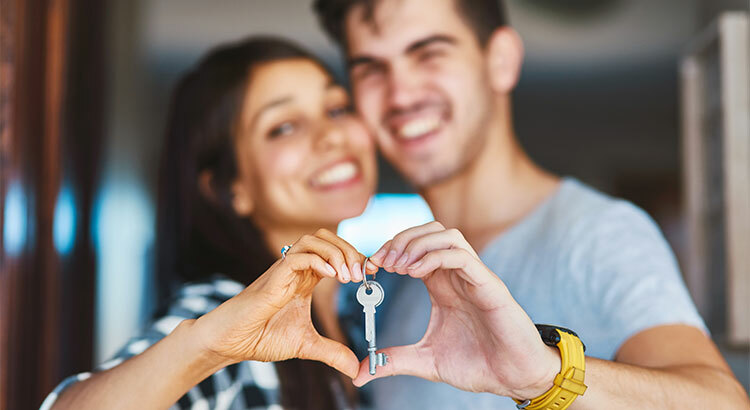 If you have any questions about the home buying process, and what it takes to purchase a home in Chandler, or the East Valley of Arizona, just call/text me at 602-295-6807 and I can help evaluate your ability to purchase your first home! Troy has been blogging about Chandler and East Valley Real Estate in Arizona since 2006. He stays current on local Chandler real estate by attending educational classes, and talking with title companies, home inspectors, lenders, members of the Chandler community, as well as constantly working with home buyers, home sellers, and investors within the Chandler and East Valley community. For more information – Contact Troy at (602) 295-6807, or TroyEricksonRealtor@gmail.com today. 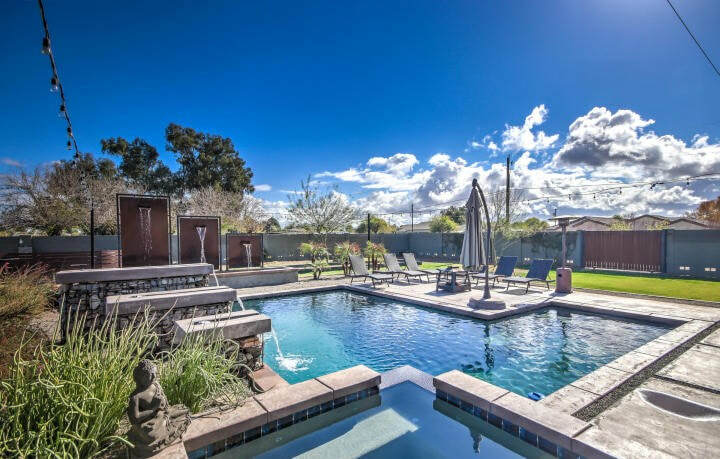 Troy and Mia are your Chandler Arizona Real Estate Connection - an experienced team with Diverse Solutions Realty. Troy is a licensed Realtor in the state of Arizona.